In ‘Camera Work’ in 1909 Stieglitz published in fine photogravure form some photographic experiments which he had undertaken with White in 1907. These had come after discussions with artists who believed that the camera did not have the same expressive potential as painting. Resulting works such as ‘Torso’ (AGNSW collection) show the artists’ response through symbolic referents, portraying the body through a subtle evocation of light to enhance a mood of sensual contemplation. 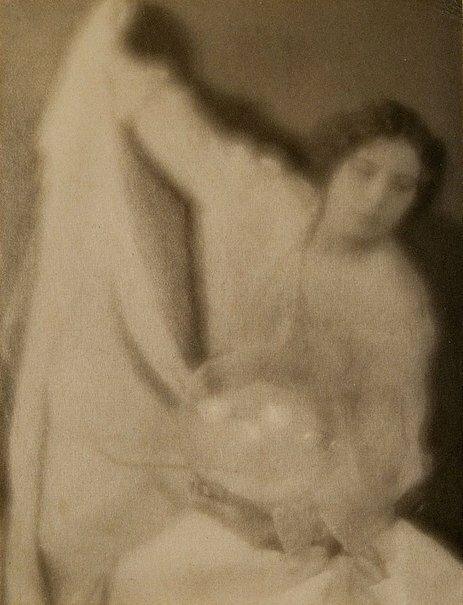 The photographers similarly elaborate on the symbolist iconography of ‘Experiment 28 (lady with crystal ball in hand)’ to infer a mood of mysticism, activating the blurred effects of white light against a shadowed background to envelope the subject in a dream-like ambience.